Our range of products include Sterile Vessel With Flush Bottom Valve, Sterile Filling Vessel, Sterile Pressure Vessel, Filling Mixing Vessel, Industrial Fermenter and Storage SS Vessel. Electropolishing is the standard for our range of Pressure vessels, many of our customers opting for mechanical polishing which smoothes the metal’s surface to facilitate film or soil removal and reduce contamination and adhesive.Our Pressure Vessels are progressively polished to free all product contact surfaces or visible imperfections, such as inclusions and pits, for maximum hygiene, release-ability and clean-ability. Electropolishing is the standard for our range of Pressure vessels, many of our customers opting for mechanical polishing which smoothes the metal’s surface to facilitate film or soil removal and reduce contamination and adhesive. 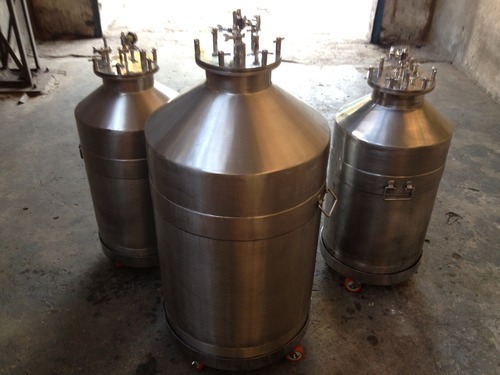 Conical top in pressure vessel' round body of filling vessels. Optional trolley with wheels for easy movability. Free and clean working area around the charging port. Magnetically powered drive, NO SEALS/ NO SHAFT thereby eliminating contamination. Easy removable of drive unit. Variable speed drive allows to control of mixing speed while batch preparation. • Top mechanical agitator with two layer six blade impeller one layer deformer and four baffles. • Single/double Mechanical seal . • Sterisible sampling and flush bottom valve. Features We design, manufacture and supply the complete customized automated (Sterile/Non-Sterile) Ointment/Cream Plant as per the latest cGMP norms with the required Qualification Documents as per the requirements. Oil Phase Jacketed & Agitated Vessels, Water Phase Jacketed & Agitated Vessels, Manufacturing Vessels with special high viscosity, intimate mixing agitator and in-built or external Micro-Homogenizer having Auto Lifting top lid device & Heating cooling facility, Mixing under vacuum condition and Storage Vessels with or without Agitators.